Scale and innovation. 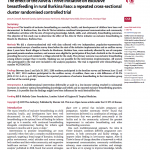 In its first five years (2009 to 2014), Alive & Thrive demonstrated that innovative approaches to improving feeding practices could be delivered with impact and at scale in three contexts: Bangladesh, Ethiopia, and Viet Nam. 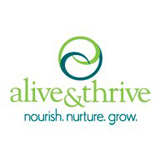 Alive & Thrive is now supporting others to scale up nutrition by applying and adapting tested, proven approaches and tools in contexts such as Burkina Faso, India, and Southeast Asia. With its emphasis on learning and innovation,Alive & Thrive is expanding its focus in Bangladesh to maternal nutrition and taking a more multisectoral approach in Ethiopia. A&T aims to reach more than 16 million children under two years old in Bangladesh, Ethiopia and Viet Nam, and to create program models that can be replicated worldwide. 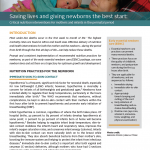 In Viet Nam, A&T worked with the Ministry of Health, the National Institute of Nutrition (NIN), the Women’s Union, the Viet Nam General Confederation of Labor (VGCL) and provincial authorities to double the rate of exclusive breastfeeding, improve the quality and quantity of complementary foods, and reduce stunting by two percentage points each year. These objectives were attained through different strategies including policy engagement, interpersonal counseling delivered through two distinct service delivery platforms, use of mass media, and the strategic use of data.